Biography*: He gained the title of Comte de Brionne [Normandy]. Benefactor of the Abbey of Bec in Normandy. He was also known as Gilbert 'Crispin' de Brionne. 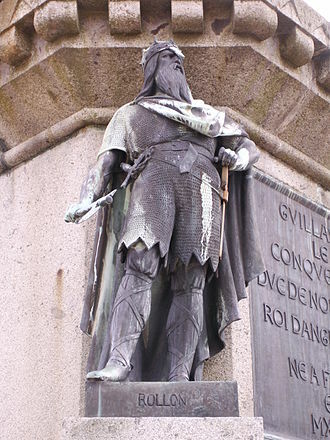 Gilbert (or Giselbert) Crispin (1000 – c.?1040) was a Norman noble, Count of Eu, and Count of Brionne in northern France. He was a guardian of young Duke William in his minority. Gilbert was son of Geoffrey, Count of Eu (b. 962) who was an illegitimate child of Richard the Fearless. He inherited Brionne, becoming one of the most powerful landowners in Normandy. Gilbert was a generous benefactor to Bec Abbey founded by his former knight Herluin in 1031. When Robert I died in 1035 his illegitimate son William inherited his father's title. Several leading aristocrats, including Gilbert of Brionne, Osbern the Seneschal and Alan of Brittany, became William's guardians. A number of Norman barons including Ralph de Gacé would not accept an illegitimate son as their leader. In 1040 an attempt was made to kill William but the plot failed. Gilbert however was murdered while he was peaceably riding near Eschafour. It is believed two of his killers were Ralph of Wacy and Robert de Vitot. This appears to have been an act of vengeance for the wrongs inflicted upon the orphan children of Giroie by Gilbert., and it is not clear what Ralph de Gacé had to do in the business. Fearing they might meet their father's fate, his sons Richard and his brother Baldwin were conveyed by their friends to the court of Baldwin, Count of Flanders. [S746] Wikipedia, online http://Wikipedia.com, http://en.wikipedia.org/wiki/Gilbert,_Count_of_Brionne. Richard the Fearless as part of the Six Dukes of Normandy statue in the town square of Falaise. Biography*: Richard I of Normandy (28 August 933 – 20 November 996), also known as Richard the Fearless (French, Sans Peur), was the Duke of Normandy. Dudo of Saint-Quentin, whom Richard commissioned to write his De moribus et actis primorum Normanniae ducum (Latin, On the Customs and Deeds of the First Dukes of Normandy), called him a dux, but this use of the word may have been in the context of Richard's leadership in war, and not a reference to a title of nobility. Richard either introduced feudalism into Normandy, or he greatly expanded it. By the end of his reign, most important landholders held their lands in feudal tenure. Richard was born to William I of Normandy, princeps or ruler of Normandy, and Sprota. He was also the grandson of the famous Rollo. He was about 10 years old when his father was killed on 17 December 942. His mother was a Breton concubine captured in war and bound to William by a Danish marriage. William was told of the birth of a son after the battle with Riouf and other Viking rebels, but his existence was kept secret until a few years later when William Longsword first met his son Richard. After kissing the boy and declaring him his heir, William sent Richard to be raised in Bayeux. After William was killed, Sprota became the wife of Esperleng, a wealthy miller; Rodulf of Ivry was their son and Richard's half-brother. When his father died, Louis IV of France seized Normandy, installed the boy Richard in his father's office, then placed him in the care of the count of Ponthieu. The king then split the lands, giving lands in lower Normandy to Hugh the Great. Louis kept Richard in confinement at Lâon, but he escaped with the assistance of Osmond de Centville, Bernard de Senlis (who had been a companion of Rollo of Normandy), Ivo de Bellèsme, and Bernard the Dane (ancestor of families of Harcourt and Beaumont). In 946, Richard agreed to "commend" himself to Hugh, Count of Paris. He then allied himself with the Norman and Viking leaders, drove Louis out of Rouen, and took back Normandy by 947. In 962 Theobald I, Count of Blois, attacked Rouen, Richard’s stronghold, but his army was defeated by the Normans and retreated never having crossed the Seine. Lothair king of the West Franks stepped in to prevent any further war between the two. Afterwards, and until his death in 996, Richard concentrated on Normandy itself, and participated less in Frankish politics and petty wars. In lieu of building up the Norman Empire by expansion, he stabilized the realm, and united his followers into a cohesive and formidable principality. Richard used marriage to build strong alliances . His marriage to Emma connected him to the Capet family. His wife Gunnor, from a rival Viking group in the Cotentin, formed an alliance to that group, while her sisters form the core group that was to provide loyal followers to him and his successors. His daughters provided valuable marriage alliances with powerful neighboring counts as well as to the king of England. He also built on his relationship with the church, restoring their lands and ensured the great monasteries flourished. His reign was marked by an extended period of peace and tranquility. William, Count of Eu (ca. 972-26 January 1057/58), m. Lasceline de Turqueville (d. 26 January 1057/58). Fressenda or Fredesenda (ca. 995-ca. 1057), second wife of Tancred de Hauteville. 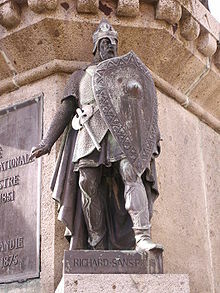 [S746] Wikipedia, online http://Wikipedia.com, http://en.wikipedia.org/wiki/Richard_I,_Duke_of_Normandy. Biography*: Rollo (c. 846 – c. 932), baptised Robert and so sometimes numbered Robert I to distinguish him from his descendants, was a Norse Viking who was founder and first ruler of the Viking principality which soon became known as Normandy. His descendants were the Dukes of Normandy, and following the Norman conquest of England in 1066, kings of England. The name "Rollo" is a Latin translation from the Old Norse name Hrólfr, modern Icelandic name Hrólfur and Scandinavian name Rolf (cf. the latinization of Hrólfr into the similar Roluo in the Gesta Danorum), but Norman people called him by his popular name Rou(f) (see Wace's Roman de Rou). Sometimes his name is turned into the Frankish name Rodolf(us) or Radulf(us) or the French Raoul, that are derived from it. Started in the late 9th century, the Anglo-Saxon Chronicle is the earliest record of Rollo. However, it does not mention his origins. A.D. 876. This year Rolla penetrated Normandy with his army; and he reigned fifty winters. Rollo was a powerful Viking leader of contested origin. Dudo of Saint-Quentin, in his De moribus et actis primorum Normannorum ducum, tells of a powerful Danish nobleman at loggerheads with the king of Denmark, who had two sons, Gurim and Rollo; upon his death, Rollo was expelled and Gurim killed. Dudo's chronicle, commissioned for Richard I, was finished, sometime after 1015, for Richard II, whose sister, Emma, married the Danish King Cnut, in 1017. William of Jumièges also mentions Rollo's prehistory in his continuation of Dudo's work, Gesta Normannorum Ducum, but states that he came from the Danish town of Fakse. Norwegian and Icelandic historians, basing their research on medieval Norwegian and Icelandic sagas, identified Rollo instead with Ganger Hrolf (Hrolf, the Walker), a son of Rognvald Eysteinsson (fl. 865), Earl of Møre in Western Norway. The Latin Historia Norvegiae, written in Norway at the end of the 12th century, offers the oldest source of this version. This Hrolf fell foul of the Norwegian king Harald Fairhair (c. 850 – c. 932, reigned c. 872 – 930), and became a Jarl in Normandy. The nickname "the Walker", "Ganger" in Norse, came from being so big that no horse could carry him. Geoffrey of Malaterra, in his The Deeds of Count Roger of Calabria & Sicily & of Duke Robert Guiscard his brother claims Rollo "sailed boldly from Norway". The question of Rollo's origins became a matter of heated dispute between Norwegian and Danish historians of the 19th and early 20th centuries, particularly in the run-up to Normandy's millennium anniversary in 1911. Today, the debate continues. The Yngling "Fairhair dynasty" lineage introduced in Hversu Noregr byggðist ("How Norway was settled") and the Orkneyinga and Heimskringla sagas suggests a line of Rollo going back to Fornjót, the primeval "king" who "reigned over" Finland and Kvenland. The claimed line leading to Rollo includes Rognvald Eysteinsson, the founder of the Earldom of Orkney. In 885, Rollo was one of the lesser leaders of the Viking fleet which besieged Paris under Sigfred. Legend has it that an emissary was sent by the king to find the chieftain and negotiate terms. When he asked for this information, the Vikings replied that they were all chieftains in their own right. In 886, when Sigfred retreated in return for tribute, Rollo stayed behind and was eventually bought off and sent to harry Burgundy. Later, he returned to the Seine with his followers (known as Danes, or Norsemen). He invaded the area of northern France now known as Normandy. In 911 the Vikings under Rollo again launched an attack on Paris before laying siege to Chartres. The Bishop of Chartres, Joseaume, made an appeal for help which was answered by Robert, Marquis of Neustria, Richard, Duke of Burgundy and Manasses, Count of Dijon. On 20 July 911, at the Battle of Chartres, Frankish forces defeated Rollo despite the absence of many French barons and also the absence of the French King Charles the Simple. In the Treaty of Saint-Clair-sur-Epte (911) with King Charles, Rollo pledged feudal allegiance to the king, changed his name to the Frankish version, and converted to Christianity, probably with the baptismal name Robert. In return, King Charles granted Rollo land between the Epte and the sea as well as parts of Brittany and according to Dudo of St. Quentin, the hand of the King's daughter, Gisela, although this marriage and Gisela herself are unknown to Frankish sources. He was also the titular ruler of Normandy, centered around the city of Rouen. There exists some argument among historians as to whether Rollo was a "duke" (dux) or whether his position was equivalent to that of a "count" under Charles. According to legend, when required to kiss the foot of King Charles, as a condition of the treaty, he refused to perform so great a humiliation, and when Charles extended his foot to Rollo, Rollo ordered one of his warriors to do so in his place. His warrior then lifted Charles' foot up to his mouth causing the king to fall to the ground. After 911, Rollo stayed true to his word of defending the shores of the Seine river in accordance to the Treaty of Saint-Clair-sur-Epte. However, he also continued attacks on Flanders. After Charles was deposed by Robert I in 922, Rollo considered his oath to the King of France at an end. It started a period of expansion westwards. Negotiations with French barons ended with Rollo being given Le Mans and Bayeux and continued with the seizure of Bessin in 924. The following year the Normans attacked Picardy. Rollo began to divide the land between the Epte and Risle rivers among his chieftains and settled there with a de facto capital in Rouen. Over time, Rollo's men intermarried with the local women, and became more settled into French Catholic culture as Normans. Gerloc, wife of William III, Duke of Aquitaine. Dudo fails to identify her mother, but later chronicler William of Jumieges makes this explicit. (perhaps) Kadlin, said by Ari the Historian to have been daughter of Ganger Hrolf, traditionally identified with Rollo. She married a Scottish King called Bjolan, and had at least a daughter called Midbjorg, she was taken captive by and married Helgi Ottarson. Sometime around 927, Rollo passed the fief in Normandy to his son, William Longsword. Rollo may have lived for a few years after that, but certainly died before 933. Even though Rollo had converted to Christianity, some of his prior religious roots surfaced at the end. Biography*: As a result of her marriage, Poppa of Normandy de Valois was styled as Duchesse de Normandie. Biography*: Rognvald "The Wise" Eysteinsson (son of Eystein Ivarsson) is the founder of the Earldom of Orkney in the Norse Sagas. Three quite different accounts of the creation of the Norse earldom on Orkney and Shetland exist. The best known is that found in the Heimskringla, but other older traditions are found in the Historia Norvegiae and the Fragmentary Annals of Ireland. The saga accounts are the best known, and the latest, of the three surviving traditions concerning Rognvald and the foundation of the Earldom of Orkney. Recorded in the 13th century, their views are informed by Norwegian politics of the day. Once, historians could write that no-one denied the reality of Harald Fairhair's expeditions to the west recounted in Heimskringla, but this is no longer the case. The Norwegian contest with the Kings of Scots over the Hebrides and the Isle of Man in the middle 13th century underlies the sagas. In the Heimskringla, Rognvald is Earl of Møre. He accompanies Harald Fairhair on his great expeditions to the west, to Ireland and to Scotland. Here, Rognvald's son Ivarr is killed. In compensation King Harald grants Rognvald Orkney and Shetland. Rognvald himself returns to Norway, giving the northern isles to his brother Sigurd Eysteinsson. The Heimskringla recounts other tales of Rognvald. It tells how he causes Harald Finehair to be given his byname Fairhair by cutting and dressing his hair, which had been uncut for ten years on account of Harald's vow never to cut it until he was ruler of all Norway, and it makes him the father of Ganger-Hrólf, identified by saga writers with the Rollo (Hrólfr), ancestor of the Dukes of Normandy, who was said to have been established as Count of Rouen by King Charles the Simple in 931. Earl Rognvald is killed by Harald's son Halfdan Hålegg. Rognvald's death is avenged by his son, Earl Turf-Einar, from whom later Orkney earls claimed descent, who kills Halfdan on North Ronaldsay. The Historia Norvegiae's account of Rognvald and the foundation of the Orkney earldom is the next oldest, probably dating from the 12th century. This account contains much curious detail on Orkney, including the earliest account of the Picts as small people who hid in the daytime, but it has little to say about Rognvald. In the days of Harald Fairhair, king of Norway, certain pirates, of the family of the most vigorous prince Ronald [Rognvald], set out with a great fleet, and crossed the Solundic sea..., and subdued the islands to themselves. And being there provided with safe winter seats, they went in summer-time working tyranny upon the English, and the Scots, and sometimes also upon the Irish, so that they took under their rule, from England, Northumbria; from Scotland, Caithness; from Ireland, Dublin, and the other sea-side towns. This account does not associate Rognvald with the earldom, but instead attributes it to his anonymous kinfolk. ...for it was not long before this that there had been every war and every trouble in Norway, and this was the source of that war in Norway: two younger sons of Albdan, king of Norway, drove out the eldest son, i.e. Ragnall son of Albdan, for fear that he would seize the kingship of Norway after their father. So Ragnall came with his three sons to the Orkney Islands. Ragnall stayed there then, with his youngest son. Fragmentary Annals of Ireland , FA 330. Edited and translated by Joan N. Radnor. The oldest account of the Rognvald and the earldom of Orkney is that found in the Fragmentary Annals of Ireland. The annals survive only in incomplete copies made by Dubhaltach Mac Fhirbhisigh in the 17th century, but the original annals are believed to date from the lifetime of Donnchad mac Gilla Pátraic (died 1039). The annals are known to have had an influence on later writings in Iceland. The annals make Rognvald the son of "Halfdan, King of Lochlann." This is generally understood to mean Halfdan the Black, which would make the Rognvald of the annals the brother of Harald Finehair. However, the sagas claim that Rognvald's grandfather was named Halfdan. These events are placed after an account of the devastation of Fortriu, dated to around 866, and the fall of York, reliably dated to late 867. However, such an early date makes it difficult to reconcile the saga claims that Harald Fairhair was involved in Rognvald's conquest of the northern isles. Harald Finehair's victory in the Battle of Hafrsfjord, which gave him dominion over parts of Norway, is traditionally dated to 872, but was probably later, perhaps as late as 900. What little is known of Scottish events in the period from the Chronicle of the Kings of Alba would correspond equally well with Harald's attacks on Scotland in the reign of Domnall mac Causantín (ruled 889–900). However, this would not correspond with the sequence in the earliest account of the origins of the Orkney earldom, which places this a generation earlier. Rognvald having given his earldom to Sigurd, according to the Orkneyinga Saga, the latter died in a curious fashion after a battle with Máel Brigte of Moray. Sigurd's son Gurthorm ruled for a single winter after this and died childless. Biography*: Dafydd ap Llywelyn (c. March 1212 - 25 February 1246) was Prince of Gwynedd from 1240 to 1246. He was the first ruler to claim the title Prince of Wales. Though birth years of 1208, 1206, and 1215 have been put forward for Dafydd, it has recently been persuasively argued that he was born shortly after Easter 1212. Born at Castell Hen Blas, Coleshill, Bagillt in Flintshire, he was the only son of Llywelyn the Great by his wife, Joan (daughter of King John).His grandfather was facing trouble in England against his Barons when he was born. In his final years, Llywelyn went to great lengths to have Dafydd accepted as his sole heir. By Welsh law, Dafydd's older half brother, Gruffydd had a claim to consideration as Llywelyn's successor. Llywelyn had Dafydd recognised as his named heir by his uncle King Henry III of England in 1220, and also had Dafydd's mother Joan declared legitimate by the Pope to strengthen Dafydd's position. There was considerable support for Gruffydd in Gwynedd. Although Dafydd lost one of his most important supporters when his mother died in 1237, he retained the support of Ednyfed Fychan, the Seneschal of Gwynedd and the wielder of great political influence. Llywelyn suffered a paralytic stroke in 1237, and Dafydd took an increasing role in government. Dafydd ruled Gwynedd following his father's death in 1240. Although King Henry III of England had accepted his claim to rule Gwynedd, he was not disposed to allow him to retain his father's conquests outside Gwynedd. As the diplomatic situation deteriorated, Dafydd began to explore the possibility of allying with others against Henry, and is known to have sent ambassadors to the court of Louis IX of France. In August 1241, however, the King invaded Gwynedd, and after a short campaign, Dafydd was forced to submit. Under the terms of the Treaty of Gwerneigron, he had to give up all his lands outside Gwynedd, and also to hand over to the King his half-brother Gruffydd. whom he had imprisoned. Henry thereby gained what could have been a useful weapon against Dafydd, with the possibility of setting Gruffydd up as a rival to Dafydd in Gwynedd, but Gruffydd died trying to escape from the Tower of London by climbing down a knotted sheet, and fell to his death in March 1244. This freed Dafydd's hands, and he entered into an alliance with other Welsh princes to attack English possessions in Wales. Dafydd enjoyed several successes in the north; by March 1245 Dafydd had recovered the castle of Mold along with his former possessions in modern-day Flintshire, and it is possible that the castle of Dyserth also fell to his men in the summer. In August 1245 King Henry again invaded Gwynedd, but his army suffered a defeat in a narrow pass by Dafydd's men. Undaunted, Henry proceeded as far as the river Conwy, and began building a new castle at Deganwy. Dafydd also began diplomacy with Pope Innocent IV, the result of which was a recognition by the Vatican of his right to rule over north Wales. After a flurry of diplomatic activity by Henry, the decision was reversed in 1245. Savage fighting continued at Deganwy until Henry, some of whose supplies had been captured by the Welsh, ran short of provisions. A truce was agreed and Henry's army withdrew in the autumn. The truce remained in effect throughout the winter, but the war was effectively ended by the sudden death of Dafydd in the royal home at Abergwyngregyn, in February 1246. He was buried with his father at the abbey of Aberconwy. The writer of Brut y Tywysogyon described him as 'tarian Cymru' - the shield of Wales. The poet Dafydd Benfras composed an elegy in his honour. Biography*: Llywelyn ap Iorwerth, Prince of North Wales also went by the nick-name of Llwelyn 'the Great'. He gained the title of Prince Llywelyn of North Wales in 1195. He hanged the Anglo-Norman baron, William de la Braose, for having an affair with his wife. Llywelyn the Great (Welsh: Llywelyn Fawr, full name Llywelyn ab Iorwerth, (c. 1172 – 11 April 1240) was a Prince of Gwynedd in north Wales and eventually de facto ruler over most of Wales. By a combination of war and diplomacy he dominated Wales for forty years. During Llywelyn's boyhood, Gwynedd was ruled by two of his uncles, who split the kingdom between them, following the death of Llywelyn's grandfather, Owain Gwynedd, in 1170. Llywelyn had a strong claim to be the legitimate ruler and began a campaign to win power at an early age. He was sole ruler of Gwynedd by 1200 and made a treaty with King John of England that year. Llywelyn's relations with John remained good for the next ten years. He married John's natural daughter Joan in 1205, and when John arrested Gwenwynwyn ab Owain of Powys in 1208, Llywelyn took the opportunity to annex southern Powys. In 1210, relations deteriorated, and John invaded Gwynedd in 1211. Llywelyn was forced to seek terms and to give up all lands east of the River Conwy, but was able to recover them the following year in alliance with the other Welsh princes. He allied himself with the barons who forced John to sign the Magna Carta in 1215. By 1216, he was the dominant power in Wales, holding a council at Aberdyfi that year to apportion lands to the other princes. Biography*: Owain ap Gruffudd (c.?1080 – 28 November 1170) was King of Gwynedd, north Wales, from 1137 until his death in 1170, succeeding his father Gruffudd ap Cynan. He was the first to be styled "Prince of Wales". He is considered to be the most successful of all the North Welsh princes prior to his grandson, Llywelyn the Great. He became known as Owain Gwynedd (Middle Welsh: Owain Gwyned, "Owain of Gwynedd") to distinguish him from the contemporary king of southern Powys Owain ap Gruffydd ap Maredudd, who became known as "Owain Cyfeiliog". Owain Gwynedd was a member of the House of Aberffraw, the senior branch of the dynasty of Rhodri the Great. Owain's father, Gruffudd ap Cynan, was a strong and long-lived ruler who had made the principality of Gwynedd the most influential in Wales during the sixty-two years of his reign, using the island of Anglesey as his power base. His mother, Angharad ferch Owain, was the daughter of Owain ab Edwin of Tegeingl. Owain Gwynedd was the second of three sons of Gruffydd and Angharad. Owain is thought to have been born on Anglesey about the year 1100. By about 1120 Gruffydd had grown too old to lead his forces in battle and Owain and his brothers Cadwallon and later Cadwaladr led the forces of Gwynedd against the Normans and against other Welsh princes with great success. His elder brother Cadwallon was killed in a battle against the forces of Powys in 1132, leaving Owain as his father's heir. Owain and Cadwaladr, in alliance with Gruffydd ap Rhys of Deheubarth, won a major victory over the Normans at Crug Mawr near Cardigan in 1136 and annexed Ceredigion to their father's realm. On Gruffydd's death in 1137, therefore, Owain inherited a portion of a well-established kingdom, but had to share it with Cadwaladr. In 1143 Cadwaladr was implicated in the murder of Anarawd ap Gruffydd of Deheubarth, and Owain responded by sending his son Hywel ab Owain Gwynedd to strip him of his lands in the north of Ceredigion. Though Owain was later reconciled with Cadwaladr, from 1143, Owain ruled alone over most of north Wales. In 1155 Cadwaladr was driven into exile. Owain took advantage of the civil war in England between King Stephen and the Empress Matilda to push Gwynedd's boundaries further east than ever before. In 1146 he captured the castle of Mold and about 1150 captured Rhuddlan and encroached on the borders of Powys. The prince of Powys, Madog ap Maredudd, with assistance from Earl Ranulf of Chester, gave battle at Coleshill, but Owain was victorious. All went well until the accession of King Henry II of England in 1154. Henry invaded Gwynedd in 1157 with the support of Madog ap Maredudd of Powys and Owain's brother Cadwaladr. The invasion met with mixed fortunes. Henry's forces ravaged eastern Gwynedd and destroyed many churches thus enraging the local population. The two armies met at Ewloe. Owain's men ambushed the royal army in a narrow, wooded valley, routing it completely with King Henry himself narrowly avoiding capture. The fleet accompanying the invasion made a landing on Anglesey where it was defeated. Ultimately, at the end of the campaign, Owain was forced to come to terms with Henry, being obliged to surrender Rhuddlan and other conquests in the east. "My opinion, indeed, by no means agrees with yours, for we ought to rejoice at this conduct of our adversary; for, unless supported by divine assistance, we are far inferior to the English; and they, by their behaviour, have made God their enemy, who is able most powerfully to avenge both himself and us. We therefore most devoutly promise God that we will henceforth pay greater reverence than ever to churches and holy places." Madog ap Maredudd died in 1160, enabling Owain to regain territory in the east. In 1163 he formed an alliance with Rhys ap Gruffydd of Deheubarth to challenge English rule. King Henry again invaded Gwynedd in 1165, but instead of taking the usual route along the northern coastal plain, the king's army invaded from Oswestry and took a route over the Berwyn hills. The invasion was met by an alliance of all the Welsh princes, with Owain as the undisputed leader. However, apart from a small melee at the Battle of Crogen there was little fighting, for the Welsh weather came to Owain's assistance as torrential rain forced Henry to retreat in disorder. The infuriated Henry mutilated a number of Welsh hostages, including two of Owain's sons. Henry did not invade Gwynedd again and Owain was able to regain his eastern conquests, recapturing Rhuddlan castle in 1167 after a siege of three months. The last years of Owain's life were spent in disputes with the Archbishop of Canterbury, Thomas Becket, over the appointment of a new Bishop of Bangor. When the see became vacant Owain had his nominee, Arthur of Bardsey, elected. The archbishop refused to accept this, so Owain had Arthur consecrated in Ireland. The dispute continued, and the see remained officially vacant until well after Owain's death. He was also put under pressure by the Archbishop and the Pope to put aside his second wife, Cristin, who was his first cousin, this relationship making the marriage invalid under church law. Despite being excommunicated for his defiance, Owain steadfastly refused to put Cristin aside. Owain died in 1170, and despite having been excommunicated was buried in Bangor Cathedral by the local clergy. The annalist writing Brut y Tywysogion recorded his death "after innumerable victories, and unconquered from his youth". 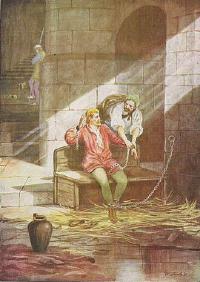 He is believed to have commissioned the propaganda text, The Life of Gruffydd ap Cynan, an account of his father's life. Following his death, civil war broke out between his sons. Owain was married twice, first to Gwladus ferch Llywarch ap Trahaearn, by whom he had two sons, Maelgwn ab Owain Gwynedd and Iorwerth Drwyndwn, the father of Llywelyn the Great, then to Cristin, by whom he had three sons including Dafydd ab Owain Gwynedd and Rhodri ab Owain Gwynedd. He also had a number of illegitimate sons, who by Welsh law had an equal claim on the inheritance if acknowledged by their father. Owain had originally designated Rhun ab Owain Gwynedd as his successor. Rhun was Owain's favourite son, and his premature death in 1147 plunged his father into a deep melancholy, from which he was only roused by the news that his forces had captured Mold castle. Owain then designated Hywel ab Owain Gwynedd as his successor, but after his death Hywel was first driven to seek refuge in Ireland by Cristina's sons, Dafydd and Rhodri, then killed at the battle of Pentraeth when he returned with an Irish army. Dafydd and Rhodri split Gwynedd between them, but a generation passed before Gwynedd was restored to its former glory under Owain's grandson Llywelyn the Great. According to legend, one of Owain's sons was Prince Madoc, who is popularly supposed to have fled across the Atlantic and colonised America. Biography*: He succeeded to the title of King of Gwynedd in 1081. Gruffudd ap Cynan (c. 1055 – 1137), sometimes written as Gruffydd ap Cynan, was King of Gwynedd from 1081, until his death in 1137. In the course of a long and eventful life, he became a key figure in Welsh resistance to Norman rule, and was remembered as King of all Wales. As a descendant of Rhodri Mawr, Gruffudd ap Cynan was a senior member of the princely house of Aberffraw. Through his mother Gruffudd had close family connections with the Norse settlement around Dublin and he frequently used Ireland as a refuge and as a source of troops. He three times gained the throne of Gwynedd and then lost it again before regaining it once more in 1099 and this time keeping power until his death. Gruffudd laid the foundations which were built upon by his son Owain Gwynedd and his great-grandson Llywelyn the Great. Unusually for a Welsh king or prince, a near-contemporary biography of Gruffudd, The history of Gruffudd ap Cynan, has survived. Much of our knowledge of Gruffudd comes from this source, though allowance has to be made for the fact that it appears to have been written as dynastic propaganda for one of Gruffudd's descendants. The traditional view among scholars was that it was written during the third quarter of the 12th century during the reign of Gruffudd's son, Owain Gwynedd, but it has recently been suggested that it may date to the early reign of Llywelyn the Great, around 1200. The name of the author Is not known. Most of the existing manuscripts of the history are in Welsh but these are clearly translations of a Latin original. It is usually considered that the original Latin version has been lost, and that existing Latin versions are re-translations from the Welsh. However Russell (2006) has suggested that the Latin version in Peniarth MS 434E incorporates the original Latin version, later amended to bring it into line with the Welsh text. According to the Life of Gruffudd ap Cynan, Gruffudd was born in Dublin and reared near Swords, County Dublin in Ireland. He was the son of a Welsh Prince, Cynan ap Iago, who was a claimant to the Kingship of Gwynedd but was probably never king of Gwynedd, though his father, Gruffudd's grandfather, Iago ab Idwal ap Meurig had ruled Gwynedd from 1023 to 1039. When Gruffudd first appeared on the scene in Wales the Welsh annals several times refer to him as "grandson of Iago" rather than the more usual "son of Cynan", indicating that his father was little known in Wales. Cynan ap Iago seems to have died while Gruffudd was still young, since the History describes his mother telling him who his father was. Gruffudd's mother Ragnhild was the daughter of Olaf of Dublin, son of King Sigtrygg Silkbeard and a member of the Hiberno-Norse Uí Ímhair dynasty. Through his mother, who appears in the list of the fair women of Ireland in the Book of Leinster, Gruffudd claimed relationships with many of the leading septs in Ireland. His great-great grandparents on his mother's side include the High King of Ireland, Brian Bóruma, and the King of Dublin and King of Northumbria, Olaf Cuarán, and Gormflaith. During his many struggles to gain the kingship of Gwynedd, Gruffudd received considerable aid from Ireland, both from the Hiberno-Norse at Dublin, but also those at Wexford, and also from Muircheartach Ua Briain. Gruffudd made his first attempt to take over the rule of Gwynedd in 1075, following the death of Bleddyn ap Cynfyn. Trahaearn ap Caradog had seized control of Gwynedd but had not yet firmly established himself. Gruffudd landed on Anglesey with an Irish force, and with the assistance of troops provided by the Norman Robert of Rhuddlan first defeated and killed Cynwrig ap Rhiwallon, an ally of Trahaearn who held Ll?n, then defeated Trahaearn himself in the battle of Gwaed Erw in Meirionnydd and gained control of Gwynedd. Gruffudd then led his forces eastwards to reclaim territories taken over by the Normans, and despite the assistance previously given by Robert of Rhuddlan attacked and destroyed Rhuddlan castle. However tension between Gruffudd's Danish-Irish bodyguard and the local Welsh led to a rebellion in Ll?n and Trahaearn took the opportunity to counterattack, defeating Gruffudd at the battle of Bron yr Erw above Clynnog Fawr the same year. Gruffudd fled to Ireland but in 1081 returned and made an alliance with Rhys ap Tewdwr prince of Deheubarth. Rhys had been attacked by Caradog ap Gruffudd of Gwent and Morgannwg, and had been forced to flee to the St David's Cathedral. Gruffudd this time embarked from Waterford with a force composed of Danes and Irish and landed near St David's, presumably by prior arrangement with Rhys. He was joined here by a force of his supporters from Gwynedd, and he and Rhys marched north to seek Trahaearn ap Caradog and Caradog ap Gruffudd who had themselves made an alliance and been joined by Meilyr ap Rhiwallon of Powys. The armies of the two confederacies met at the Battle of Mynydd Carn, with Gruffudd and Rhys victorious and Trahaearn, Caradog and Meilyr all being killed. Gruffudd was thus able to seize power in Gwynedd for the second time. He was soon faced with a new enemy, as the Normans were now encroaching on Gwynedd. Gruffudd had not been king very long when he was enticed to a meeting with Hugh Earl of Chester and Hugh Earl of Shrewsbury at Rug, near Corwen. At the meeting Gruffudd was seized and taken prisoner. According to his biographer this was by the treachery of one of his own men, Meirion Goch. Gruffudd was imprisoned in Earl Hugh's castle at Chester for many years while Earl Hugh and Robert of Rhuddlan went on to take possession of Gwynedd, building castles at Bangor, Wales Bangor, Caernarfon and Aberlleiniog. Gruffudd reappeared on the scene years later, having escaped from captivity. According to his biography he was in fetters in the market-place at Chester when Cynwrig the Tall on a visit to the city saw his opportunity when the burgesses were at dinner. He picked Gruffudd up, fetters and all, and carried him out of the city on his shoulders. There is debate among historians as to the year of Gruffudd's escape. Ordericus Vitalis mentions a "Grifridus" attacking the Normans in 1088. The History in one place states that Gruffudd was imprisoned for twelve years, in another that he was imprisoned for sixteen years. Since he was captured in 1081, that would date his release to 1093 or 1097. J.E. Lloyd favours 1093, considering that Gruffudd was involved at the beginning of the Welsh uprising in 1094. K.L. Maund on the other hand favours 1097, pointing out that there is no reference to Gruffudd in the contemporary annals until 1098. D. Simon Evans inclines to the view that Ordericus Vitalis' date of 1088 could be correct, suggesting that an argument based on the silence of the annals is unsafe. Gruffudd again took refuge in Ireland but returned to Gwynedd to lead the assaults on Norman castles such as Aber Lleiniog. The Welsh revolt had begun in 1094 and by late 1095 had spread to many parts of Wales. This induced William II of England (William Rufus) to intervene, invading northern Wales in 1095. However his army was unable to bring the Welsh to battle and returned to Chester without having achieved very much. King Willam mounted a second invasion in 1097, but again without much success. The History only mentions one invasion by Rufus, which could indicate that Gruffudd did not feature in the resistance to the first invasion. At this time Cadwgan ap Bleddyn of Powys led the Welsh resistance. In the summer of 1098 Earl Hugh of Chester joined with Earl Hugh of Shrewsbury in another attempt to recover his losses in Gwynedd. Gruffudd and his ally Cadwgan ap Bleddyn retreated to Anglesey, but then were forced to flee to Ireland in a skiff when a fleet he had hired from the Danish settlement in Ireland accepted a better offer from the Normans and changed sides. The situation was changed by the arrival of a Norwegian fleet under the command of King Magnus III of Norway, also known as Magnus Barefoot, who attacked the Norman forces near the eastern end of the Menai Straits. Earl Hugh of Shrewsbury was killed by an arrow said to have been shot by Magnus himself. The Normans were obliged to evacuate Anglesey, and the following year Gruffudd returned from Ireland to take possession again, having apparently come to an agreement with Earl Hugh of Chester. With the death of Hugh of Chester in 1101 Gruffudd was able to consolidate his position in Gwynedd, as much by diplomacy as by force. He met King Henry I of England who granted him the rule of Ll?n, Eifionydd, Ardudwy and Arllechwedd, considerably extending his kingdom. By 1114 he had gained enough power to induce King Henry to invade Gwynedd in a three-pronged attack, one detachment led by King Alexander I of Scotland. Faced by overwhelming force, Gruffudd was obliged to pay homage to Henry and to pay a heavy fine, but lost no territory. By about 1118 Gruffudd's advancing years meant that most of the fighting which pushed Gwynedd's borders eastward and southwards was done by his three sons by his wife Angharad, daughter of Owain ab Edwin of Tegeingl: Cadwallon, Owain Gwynedd and later Cadwaladr. The cantrefs of Rhos and Rhufoniog were annexed in 1118, Meirionnydd captured from Powys in 1123 and Dyffryn Clwyd in 1124. Another invasion by the king of England in 1121 was a military failure. The king had to come to terms with Gruffudd and made no further attempt to invade Gwynedd during Gruffudd's reign. The death of Cadwallon in a battle against the forces of Powys near Llangollen in 1132 checked further expansion for the time being. Gruffudd was now powerful enough to ensure that his nominee, David the Scot was consecrated as Bishop of Bangor in 1120. The see had been effectively vacant since Bishop Hervey le Breton had been forced to flee by the Welsh almost twenty years before, since Gruffudd and King Henry could not agree on a candidate. David went on to rebuild Bangor Cathedral with a large financial contribution from Gruffudd. Owain and Cadwaladr in alliance with Gruffudd ap Rhys of Deheubarth gained a crushing victory over the Normans at Crug Mawr near Cardigan in 1136 and took possession of Ceredigion. The latter part of Guffydd's reign was considered to be a "Golden Age"; according to the Life of Gruffudd ap Cynan Gwynedd was "bespangled with lime-washed churches like the stars in the firmament". Gruffudd died in his bed, old and blind, in 1137 and was mourned by the annalist of Brut y Tywysogion as the head and king and defender and pacifier of all Wales. He was buried by the high altar in Bangor Cathedral which he had been involved in rebuilding. He also made bequests to many other churches, including one to Christ Church Cathedral, Dublin where he had worshipped as a boy. He was succeeded as king of Gwynedd by his son Owain Gwynedd. His daughter, Gwenllian, who married Gruffudd ap Rhys of Deheubarth, son of his old ally Rhys ap Tewdwr, is also notable for her resistance to English rule.